In recent years, we have seen a dramatic increase in the capability to perform fast tomographic data acquisition. Fast acquisition is of crucial importance to enable 3D imaging of dynamic processes. At the same time, it also holds the potential to transform tomography from a technique used for research purposes into a powerful inspection tool capable of scanning hundreds of objects in sequence. The ability to acquire tomographic datasets at sub-second rates also imposes new challenges and opportunities on the computational part of the tomography pipeline. Data transport, high-performance computing, efficient algorithms for reconstruction and visualization must all be connected to keep up with the acquisition speed. In this focused mini-workshop, which is part of the EXTREMA COST Action, the participants will engage in an in-depth discussion on the state-of-the-art and future prospects of combining fast data-acquisition with real-time data processing and computing capabilities. The programme will consist of lectures by experts in fast image acquisition, high-performance computing, image reconstruction, and other related fields. The workshop will have an informal character, with ample time reserved for hands-on discussions. It is our privilege to announce the 2nd Neutron Imaging and Neutron Methods in Archaeology and Cultural Heritage (NINMACH 2017) conference, to be held between 11-13 October 2017, in Budapest, Hungary, organized by the Budapest Neutron Centre. The first event of this conference series took place in Garching, Germany in 2013, with the aim to address both neutron experts and cultural heritage scientists. In the meantime this field became even more mature, substantial experimental experience was accumulated, and an advanced community of specialists was formed. We hope therefore to attain similarly high interest by providing unique opportunity to exchange ideas and discuss this interdisciplinary topic in depth. Oral presentations and poster submissions are both welcome. We also invite interested colleagues without personal experience with neutrons, in order to become familiar with the instrumentation and the possible applications. To help the conference organization, we kindly ask you to submit your contribution and register at your earliest convenience. The registration fee is foreseen to be around 250 Euro. The registration and abstract submission can be done via the INDICO conference management website at http://indico.kfki.hu/event/518/. For more information please see the attached poster, visit the conference website at the http://www.bnc.hu/ninmach2017, or contact us via e-mail: ninmach2017@bnc.hu. Please share this information with your interested colleagues and national communities. The workshop on “Visual analysis of dynamic processes” is a follow-up of the mini-workshop on data handling and treatment at the 10th World Conference on Neutron Radiography in Grindelwald, Switzerland, in October 2014 and the Lorentz Workshop on Quantitative 3D X-Ray Imaging in Leiden, the Netherlands in January 2016. During those workshops many questions were raised regarding visual analysis of dynamic processes but only few solutions were provided. 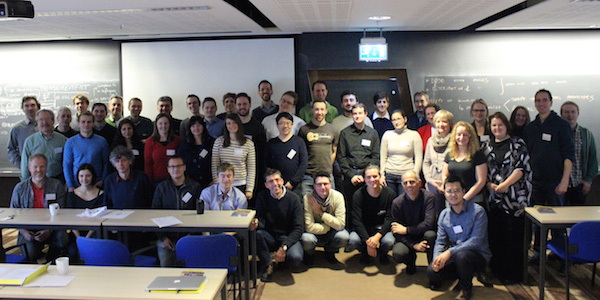 The key idea of this workshop is to bring together the communities of researchers working with X-ray and neutron CT and the communities of visual data analysis. In fact, even though at different time scales the final goal is a precise interpretation of noisy data through analysis and visualization procedures. Today, there is a clear trend emerging towards quantitative and in-situ imaging of dynamic processes. Especially in neutron and X-ray computed tomography (CT) this trend demands the integration of computation and visualization steps with data acquisition to provide the information of interest. The motivations behind are manifold and integrate the following aspects: on one side the acquisition of tomographic projections, or radiographs, and the following reconstructed slice only provide intermediate information, which requires additional data processing to extract the targeted physical parameters (quantitative imaging), on the other side, there is a strong demand to reveal the information that is contained in the images which is hidden, because of noise or artefacts, in the sheer amount of data. The required data enhancement will make it possible to push the instrument performance beyond the limitations of the instrument hardware itself. On November 7-9, the International Workshop on Process and Biomedical Tomography (ProBioTo2016) will take place, which is a scientific conference organized at Warsaw University of Technology (Warsaw, Poland). The event is part of the activities of the EU COST Action MP1207: EXTREMA - Enhanced X-ray Tomographic Recontruction: Experiment, Modeling and Algorithms. educate the academic community about the current industrial and biomedical communities needs related to tomography. To satisfy the heterogeneous needs of X-ray CT users, flexible solutions are required both from the hardware and software point of view. The use of synchrotrons and microfocus X-ray sources present complementary approaches being characterized by different properties in terms of achievable spatial resolution, field of view and image contrast. The main aim of this event was to bring together experimentalists, mathematicians and computing scientists and explore this specific topic in Computed Tomography (CT) data collection and reconstruction. This focused meeting hosted a small group of mathematicians and computational scientists at the Elettra - Sincrotrone Trieste laboratory (Italy) with the aim to study in detail the Region-Of-Interest (ROI) problem in CT. This workshop has been organized as a follow-up of the Lorentz 2015 workshop focusing our attention on the specific topic of ROI-CT. In fact, ROI-CT reconstructed images are often corrupted by artefacts that, in some cases, mask part of the information contained in the image itself. Find solutions require a full comprehension of the origin of these artefacts. Micro-CT data were analyzed on site having the ability to acquire the data at varying contrast and spatial resolutions and on different instruments. The whole object has been imaged at medium spatial resolution by using a conventional CT instrument based on a microfocus source (http://www.elettra.trieste.it/lightsources/labs-and-services/tomolab/tom...) and then a selected ROI has been selected and imaged at higher spatial resolution. A similar approach has been adopted at the SYRMEP beamline of Elettra (http://www.elettra.trieste.it/elettra-beamlines/syrmep.html) where a micro-CT instrument allowing to work at higher spatial resolution and based on a synchrotron source is available. A mixed approach employing the conventional and synchrotron sources for the same object has been also explored. The workshop has been co-funded by the EXTREMA COST Action, an European research network focused on advanced X-ray tomography and was attended by10 participants from several European countries. The Scientific Program of the workshop can be found at the link: http://www.elettra.trieste.it/Conferences/2015/ROI-CT/index.php?n=Main.Program . During the first day of the workshop 5 invited speakers have presented their work in the field of ROI-CT and the talks have been followed by 25 participants. X-ray phase contrast (PC) computed tomography (CT) has been heavily investigated over the last two decades. It holds potential to overcome the major limiting factor of conventional CT: poor contrast for soft biological tissues. This is because contrast in PC-CT is driven by phase effects rather than attenuation ones, which can be several orders of magnitude stronger than the latter. PC-CT is typically implemented using propagation-based, crystal-based or grating-based approaches. These methods, however, rely either on spatially or temporarily coherent or quasi-parallel beams. These conditions are only met at synchrotrons, or, to some extent, by micro-focal x-ray tubes. The use of synchrotrons and micro-focal x-ray tubes is not suited to many practical applications due to accessibility and x-ray flux constraints, respectively. At UCL, new approaches to PC-CT have been developed, named edge illumination PC-CT, which has been demonstrated in several instances to work well with x-ray tubes with relatively large focal spots, i.e. in a scenario that is closer to practical reality. This workshop was primarily aimed at a) identifying the origin of artefacts in edge illumination PC-CT images and b) at finding approaches towards their elimination, but also at c) gaining insight about image acquisition and reconstruction techniques employed by other groups, and d) at identifying possible future collaborations. The EXTREMA COST Action provided reimbursement for 5 participants, covering travel and lodging costs and Local Organizer Support.